Wingspan about 20 mm. 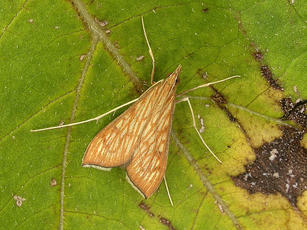 An orangey-brown and white moth that bears a superficial resemblance to Nascia cilialis, but has generally narrower forewings. Probably best looked for in areas where the larval foodplant is present. Previous records suggest September to October as the best period to see this moth in Britain. Larvae feed on Antirrhinum family, Toadflax etc. A rare migrant species to this country, mainly to the southern counties. Abroad, the species occurs from southern Europe into the tropics. In the Butterfly Conservation’s Microlepidoptera Report 2011 this species was classified as Migrant.